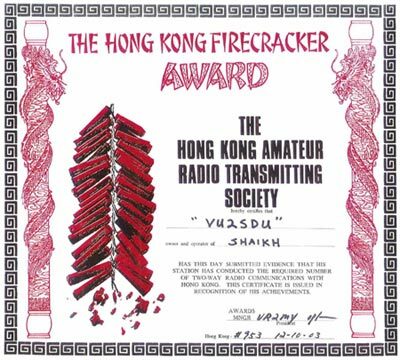 The Hong Kong Amateur Radio Transmitting Society offers the Firecracker Award to any radio amateur radio station. Contacts with 6 different VS6/VR2 stations. Stations in zones 18, 19, and 24 to 28 require contacts with 10 different VS6/VR2 Stations.